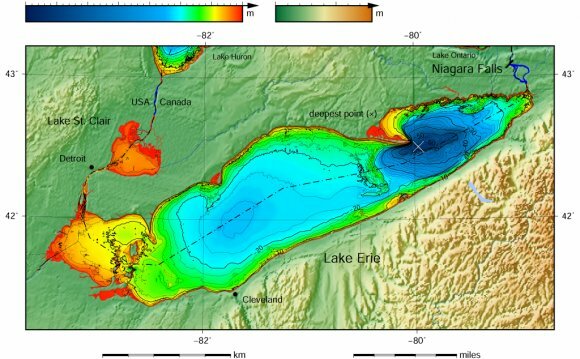 Freshwater Future Canada and Environmental Defence propose four-point plan to tackle algal blooms in Lake Erie and the Great Lakes. Pictures, as the old saying goes, speak a thousand words. A quick Google search of “Lake Erie pollution” yields an array of images that show with crystal clarity the problem of algae blooming in Lake Erie. A problem we thought was solved years ago with the invention of low-phosphate detergents and massive investments in sewage treatment is back – in a big way. Pulling Lake Erie back from the brink in the 1970’s and 80’s was one of the environmental movement’s first and greatest victories. But that victory, as we are now seeing, was short lived. The most recent evidence came earlier this month when, Toledo, Ohio declared a state of emergency, warning 400, 000 residents to avoid drinking tap water due to the presence of high levels of algal toxins in the city’s water supply. And so far, this year’s bloom has been relatively small compared to 2011’s record event, when algae covered one fifth of Lake Erie’s surface. Today, Freshwater Future Canada and Environmental Defence released a report, , that focuses on what can be done in Canada to help reduce and eliminate the algal blooms plaguing Lake Erie and other areas of the Great Lakes The main message is one of hope: this is a problem we can solve. We did it before when Lake Erie was declared “dead” because of the algae that strangled it in the 1970s. Then, concerned citizens, governments, and industry came together, spurring big action on both sides of the border to reduce the main culprit behind algal blooms: phosphorus. Phosphorus pollution, which today is coming primarily from agricultural sources, is once again causing algal blooms that can make water unsafe for people, pets, fish and wildlife, and can have serious consequences for local and regional economies. Finding ways to help farmers pay for the changes needed to stop phosphorus from washing into rivers and lakes in the first place will be critical to solving the algae issue. Innovative market-based mechanisms could be a big part of the solution. Mechanisms such as pollution taxes, where the cost of reducing or cleaning up pollution is incorporated into the cost of products and goods (like the food that farmers produce), and nutrient trading, which uses market forces to identify and direct investment to the cheapest options for reducing nutrient pollution, should be evaluated for their applicability in Ontario. Any solution will depend significantly on sound science and an action-oriented policy framework. The governments of Ontario and Canada need to invest in science to address the severe gaps in our understanding of the problem. We don’t even have a clear picture of how much phosphorus is being discharged into the Great Lakes from Canadian river systems. This makes it very difficult to know where investments in solutions will have the most impact, or how successful they will be at reducing algal blooms. Governments also have to put in place a policy framework that drives action by setting clear nutrient-reduction targets, and ensuring the monitoring systems are in place to track and report on progress. Lake Erie is once again in urgent need of help. Algal blooms are closing beaches, threatening drinking water supplies, and killing fish. Without immediate and decisive action, we may see shoreline property values plummet and major hits to the tourism economy of coastal communities. We may find that we have a lake that can no longer support its valuable fishery or provide recreational opportunities to residents and visitors. 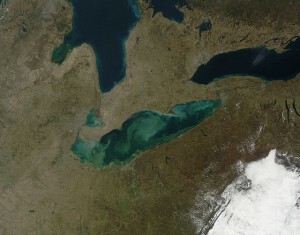 But a different future is possible in which Lake Erie is alive and well. A future of green fields producing globally and locally important foods. A future of green cities designed to work in harmony with the water cycle. And a future of beautiful, blue waters that support vibrant communities, economies and ecosystems.